The Art Nouveau engravings and Gold inlays are most attractive, but the knockout feature is the twenty-eight Diamonds set in both sides of the handle. This knife would be in the area of $8,000 at Asprey of London. The Hill brothers are the Crown Jewelers of the Netherlands. Their knives are the only Gentleman's Knives stocked in Englandâ€™s exclusive luxury shop, Asprey of London. 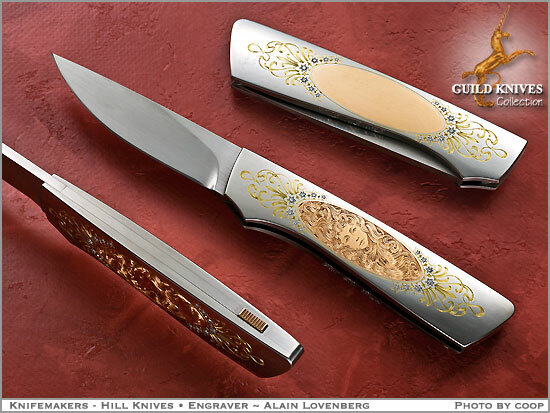 The Hill Studios in Holland with their varied craftsmen, produce a Gentlemanâ€™s Knife of spectacular quality. I was able to buy the estate of a collector and sell these investment quality knives at about half their original selling price. See their work and pictures here.